4 oz of sieved icing sugar. Whisk the egg whites until in stiff peaks. Sieve the icing sugar and add to the whipped whites. Or line the base of a 9” sandwich tin and grease the sides (or line a baking tray , draw a 9” diameter circle, grease the sheet, spread or pipe the mixture over the area of the circle – adding a little more towards the rim. 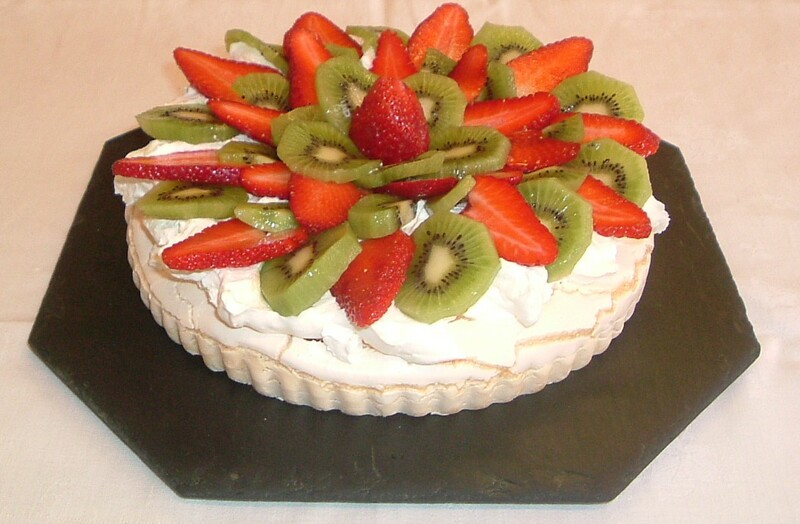 Allow to cool gradually – I usually turn the oven off and allow it to cool before removing the pavlova bases. To decorate use either 4 – 6 oz Cornish Clotted Cream or whip at least a quarter pint of Double Cream (taking care not to make too thick – nor runny) and spread evenly and thickly over the top. Decorate with slices of soft / softish, fruits. For mini-meringues. Whisk 1/4 pint double cream, place in piping tube with rosette nozzle. Pipe on one half – squeeze lightly as you stick the other half on. When all 20 paired up, place on a wire rack over a late. Melt a little chocolate (4 cubes) in a pyrex bowl in the mircowave (this takes very little time – about 2 mins – give them a shake every 30 sec to make sure they do not burn) Drizzle this over the meringues in thin zigzaggy lines and leave to harden.